Καλοτοποθετημένο στη παραλίες, ψώνια, νυχτερινή διασκέδαση περιοχή της Πουκέτ πόλης, το Elegancy Sansabai Hotel είναι το κατάλληλο μέρος για να χαλαρώσετε από τις πολυάσχολες μέρες σας. Από εδώ, οι επισκέπτες μπορούν να έχουν άμεση πρόσβαση σε όλα όσα η πόλη έχει να προσφέρει. Από τη βολική της τοποθεσία, η ιδιοκτησία προσφέρει εύκολη πρόσβαση σε κορυφαίους προορισμούς της πόλης. Στο Elegancy Sansabai Hotel, η άψογη εξυπηρέτηση και οι ανώτερες εγκαταστάσεις συντελούν ώστε η διαμονή εκεί να σας μείνει αξέχαστη. Το ξενοδοχείο σας προσφέρει μια μεγάλη επιλογή υπηρεσιών, συμπεριλαμβανομένων των δωρεάν WiFi σε όλα τα δωμάτια, 24ωρη φύλαξη, παντοπωλείο, ημερήσιος καθαρισμός, υπηρεσία ταξί. Ελάτε σε ένα από τα 76 φιλόξενα δωμάτια και ξεφύγετε από τα άγχη της ημέρας με μια ευρεία γκάμα ανέσεων, όπως επίπεδη τηλεόραση, επιπλέον μπάνιο, κρεμάστρα ρούχων, δωρεάν καφές φίλτρου, δωρεάν τσάι, που θα βρείτε σε ορισμένα από αυτά. Το ξενοδοχείο προσφέρει μια άριστη ποικιλία ψυχαγωγικών εγκαταστάσεων, όπως τα εξωτερική πισίνα, μασάζ. Όταν ψάχνετε για ένα άνετο και βολικό μέρος για να μείνετε στη Πουκέτ,το Elegancy Sansabai Hotel γίνεται το σπίτι σας μακριά από το σπίτι σας. I came with a group of buddies and we did a very last min request to change my check in date. The stuff is very helpful to accomodate to our last min request, especially with my large group of more than 10pax. The hotel is great and new. The room is comfortable and well furnished. A great place to stay. The staff are great and helpful in all expects. The only thing tat need some improvement is the variety for breakfast. The above comment is not jus me. It is a compiled comment frm all my buddies whom were there. We will definitely choose this hotel again. Thank you once again to the staffs. 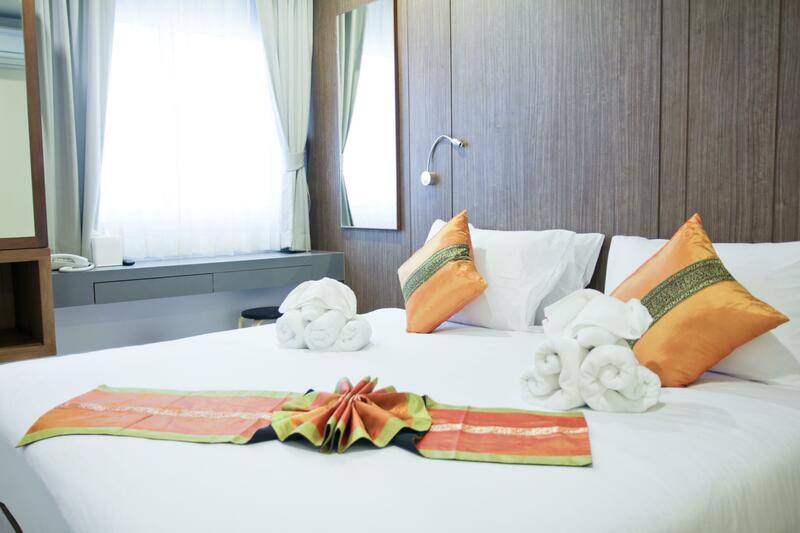 + Great location close to the beach and Bangla Road. + Nice, modern room with a French balcony and good wi-fi. + Ok breakfast buffet and afternoon tea is included. + One can borrow both beach towels and pool towels. + Friendly staff. - Small pool area with few sunbeds in the sun. Great view from here though! - It’s a bit noisy from bars and restaurants but that’s just how it is when located that central. Bring ear plugs and it’s fine! Cons: 1 -They just offer 1 room key, no matter if you booked a room with 2 single beds, so a room for 2 people. 2 - Not value for the money, you can get much better places for same or cheaper. 3- No any flexibility from staff. 4- I had an Ipad stolen from the room, staff did nothing. I asked them to check the cameras, they said I should go to the police to fill a complain and they could not do anything else. 5- Too noisy from the street downstairs, no any sound proof from the windows. Pros: Good breakfast, very near to bangla if you are looking for party. Bed was nice. I would never stay there again and would definetely not recommend to stay. Recommend this to all. Right in the heart of the action and not too noisy. Stay room 306. Perfect for me. I had a great stay at Elegancy, staff were friendly and very helpful. My room was spacious and very clean, would definitely recommend staying here. Amazing location! Very strategic location. Easy to get halal food. Location was perfect in the middle off everything very lively as soon as u step out your hotel, pool on the roof is very nice, rooms were clean and modern! Large shower ! We were traveling in a group and I forgot my bag that had my passport and around 5000 USD outside the hotel in smoking/drinking area. I called the hotel from airport and Mr.Chai(I am sorry if the spelling are incorrect) picked up my bag and sent it to the airport. Huge respect for the guy and for the hotel administration overall. About the hotel, it was very nice and value for money is 100%. 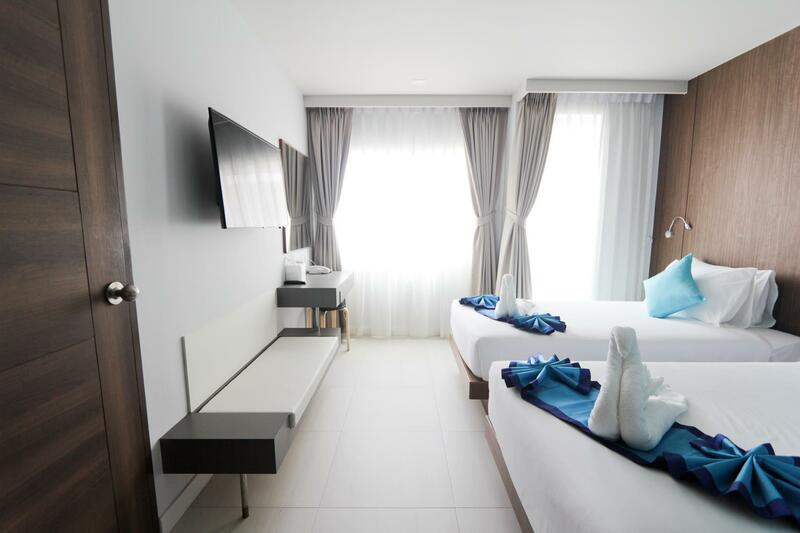 Its right in the middle of party area so if you are going to Phuket for party, this could be the best resort for you on the budget. The pool is small but very nice with great panorama of Bangla street. I recommend this hotel to every traveller going to Phuket. Great location close to everything, they also have a nice rooftop pool with amazing views of both the mountains and the ocean. The customer service was great too, especially Chi, he went out of his way to make sure my wife and my stay was relaxing and enjoyable. 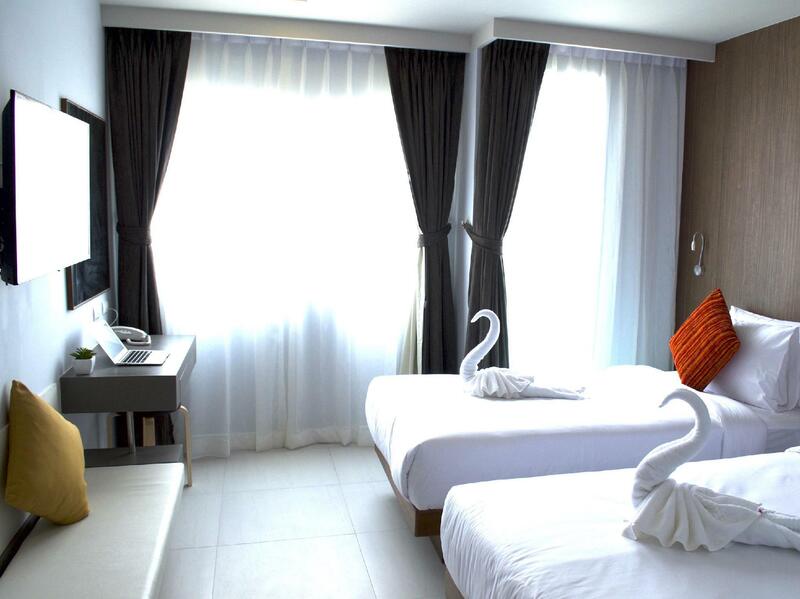 Hotel located in Soi sansabai, easy to find food, drink, massage. 7-11 just opposite. 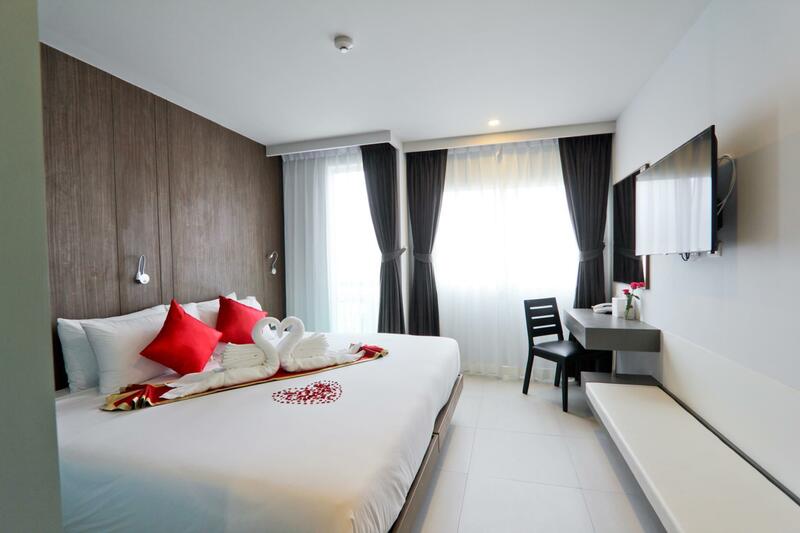 3 minutes walking distance to Bangla road, 2 minutes to shopping mall. Hotel breakfast same varieties everyday. Nice roof top pool. Will come back. Busy location. Can be a bit noisy late evening..Good breakfast and the addition of free hot drinks on the ground floor until 4.30 pm everyday was very appreciated.swimming pool sunbathing area quite small. Efficent and friendly staff. Only issue was the taxi we booked to the airport via the hotel desk took us on a different route (2hours)and into a traffic jam which meant we nearly missed hour plane.he then demanded 200 bhat extra for going back to the hotel(about a 1 mile quick return after we left to pick up a charger we accidentally left behind.. So there are 2 Elegancy hotels close to each other, a little confusing but I found this one a little further down the street. Walk out the door right onto the main street where all the fun happens. It was a short walk to the beach. Walking street was practically across the street. Had a delicious schwarma place outside the front door. There was a small pool on the top floor but I didn't use it. Only complaints I have is the shared hallways are a bit noisy when you get drunk people yelling at each other, and the water pressure was low in the shower, but I would stay here again anytime. The location is great if you love to party. It's close to walking street. Room was fine but too many people smoking outside the hotel and the AC units blow the smoke into your room and you can hear the partying all night but quite enough to sleep. Thank you Todd for staying and reviewed at Elegancy Sansabai Hotel. Hi Sayed, Thank you. 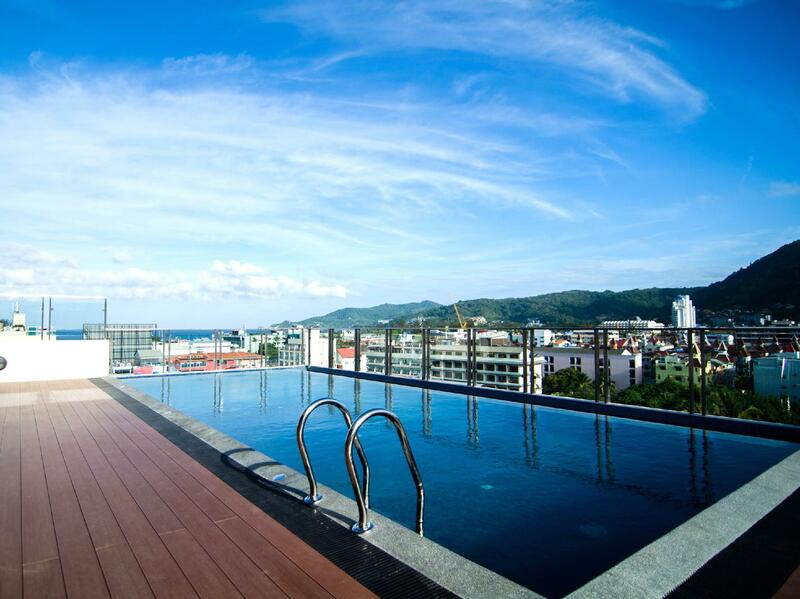 We look forward to welcome you back to PATONG, Phuket soon.